We respect your right to e-mail privacy. 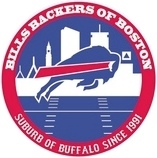 If you are no longer interested in receiving periodic messages from the Bills Backers of Boston, please use the form below to unsubscribe. While the executive committee may choose, from time to time, to send email to you on behalf of third parties, the Boston Bills Backers will never give, sell, or rent our member list to any person or organization.